Note: The HVR200-22 Red Henry Vacuum Cleaner has been replaced with the new HVR200-A2 model. You can read about this new model on our Red Henry HVR200A page. If you want to learn more about the older HVR200-22 model then keep reading. HVR200 22 Henry is a dry only vacuum cleaner with a powerful 1200W two stage motor providing high and low ("Hi" and "Lo") 2-speed operation. It has a 10m cable with an easy to use rewind system. It uses giant Tritex filters and Microflo dust bags. In case you're wondering, HVR = "Henry Vacuum Red". There are three other Henry colours, producing a Blue Henry, a Green Henry and a Yellow Henry. Which one you buy is of course up to you - but the red ones are cheaper. Why? I think it's just a question of volume - how many of each type they produce. Do check your supplier includes Kit A1 as some suppliers have shipped a cheaper aluminium version. The A1 kit metal components are made of stainless steel. When buying a Henry you want to make sure you find a good supplier. Online it can be difficult to know which suppliers you can trust but I have found, to my surprise, that Amazon sell other things beside as books. What's more they have some of the best vacuum cleaner prices and provide the security of buying from a well known and trusted brand. So I have included a Henry product link to Amazon on this site which displays their current price. And remember, with Amazon delivery is included in the price shown. 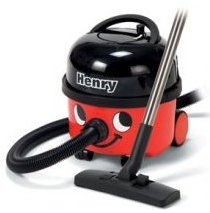 Simply click on the link to purchase your very own Henry Vacuum Cleaner. Note this link is for the older HVR200-22 model - the newer model is the HVR200A and is normally cheaper so check that out before you buy.